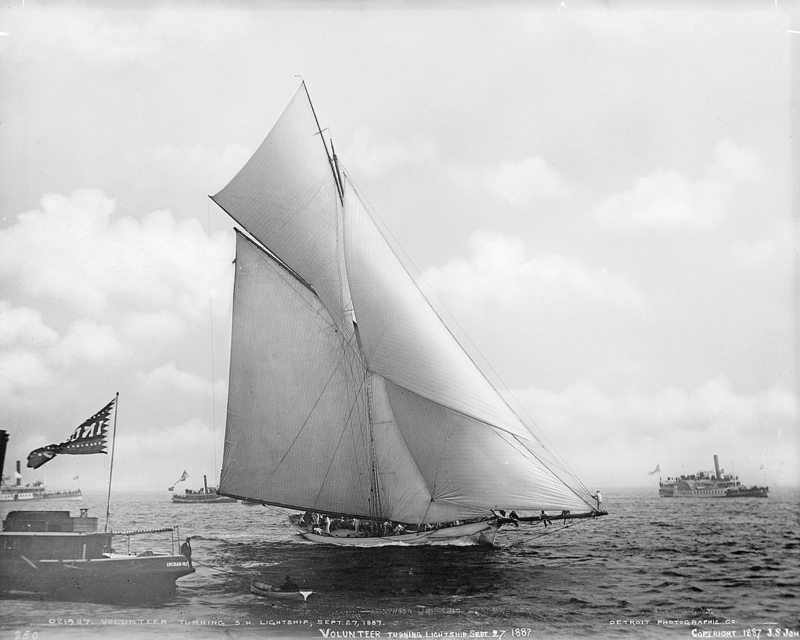 Powered by the wind — and canvas, a sailboat competes in an 1887 America's Cup race. From travel bags to ship’s sails to paintings charting the immigrant experience, the durable fabric known has canvas has touched on human migration for centuries. The word “canvas” is itself an immigrant of sorts, having originated in the Greek “cannabis” (since it was originally made of hemp) and passed through the Old French “canevas” and Anglo-French “canevaz.” Today most canvas is made from cotton or linen. Between 1492 and the development of steamships in the 1800s, nearly every immigrant to the New World arrived by way of a ship propelled by canvas sails. Flax was one of the first crops planted by colonists in North America — in part to provide linen canvas for ship’s sails and other uses. Canvas was also a key element in the construction of the iconic covered wagons in which many immigrants traveled during Westward Expansion.